Burning Earth awaits the Messiah, but which one, democratic, dictator, king, communist or a religionist? In my last article, I wrote about different eschatology concepts in major beliefs that are followed and practiced today i.e. Christianity, Judaism, Hinduism, Buddhism etc. In this article, I will write about Eschatology concept in Islam. Islam is the latest and the last monotheism religion, with the latest version of eschatological theories. These theories are available in the Quran and Hadees (sayings of Prophet Muhammad PBUH) and are available in written form and are also available on the internet. Islamic Eschatology is based on two categories. First one is regarding the prophecies that have already been fulfilled. The second category is regarding futuristic prophecies that depict futuristic events including 10 bigger signs. Following are some of the prophecies that have already been fulfilled and there is an increase in their level day by day. Following are some of the prophecies that are yet to be fulfilled and Muslims across the globe believe in their fulfillment. The Major prophecies that usually many people don’t know about, will appear close to the day of judgment. The time gap between these events is said to be very close to each other. In a saying of Prophet Muhammad PBUH, it is said that Armageddon, freedom of Constantinople (Istanbul) and the appearance of Dajjal (antichrist) will happen in only 7 months. Following are the major signs of the last hours. Mahdi means the guided one. Mahdi is an important figure in Islamic tradition. Hadees (Saying of Prophet Muhammad PBUH) states that he will be a descendant of Muhammad through Muhammad’s daughter Fatimah and cousin Ali. He will restore the religion in its purest form. He will not declare himself as a Mahdi, whereas he will be recognized by the people, from the description told by Prophet PBUH. He will not like to become the leader of Muslims, whereas he will be given the authority by the people. The Mahdi will be looked upon to kill al-Dajjal (anti-christ) to end the disintegration of the Muslim community, and to prepare for the reign of Jesus, who will rule for a time thereafter. The Mahdi will fulfill his prophetic mission, a vision of justice and peace, before submitting to Jesus’ rule. Al-Masih ad-Dajjal means “the false messiah, liar, the deceiver” is an evil figure in Islamic eschatology. He is to appear, pretending to be al-Masih (the Messiah), before the Day of Resurrection. He is an anti-messianic figure, comparable to the Antichrist in Christian and Jewish eschatology. According to hadith, Prophet Muhammad PBUH prophesied that the Masih ad-Dajjal would be the last of a series of thirty Dajjal or deceivers. In a saying, Prophet Muhammad PBUH said “His right eye will be punctured, and his left eye would be raised to his forehead and will be sparkling like a star. 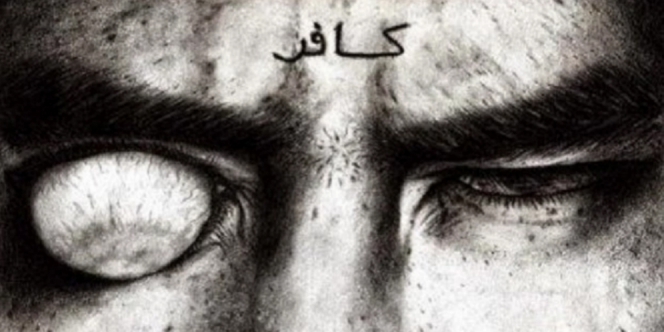 Only the believers will be able to read the word “Kafir” , inscribed in bold letters, on his forehead. There will be big mountains of smoke at both front and back sides of his caravan. People will anticipate food within those mountains, during the severe famine. All rivers, falling in his way, will dry out and he will call upon people in a loud voice, “O my friends come to me! I am your lord who has made your limbs and given you sustenance”. The following signs will occur just before his emergence and these signs are a mandatory condition for Dajjal to appear. • Drying up of Sea of Galilee. • When date-palm trees of Baisan stop bearing fruit. • Worship of Satan becomes common. • The conquest of Constantinople (modern-day Istanbul, Turkey). • He will do miracles and yield resources (minerals, food) from land by his power. • He will lay siege across the world except for the Islamic holy cities (Makkah and Medina). • He will alter the coastal tides and bring chilled winds across the Red Sea. • He would be recognizable by only a true believer of Islam. Isa is the Arabic name for Jesus Christ, and his return is considered as the third major sign of the last days. Although Muhammad is the preeminent Prophet in Islam. Jesus is mentioned in the Quran, who is said not to have died but to have been raised up by God into the skies. Thus, in accordance Quran and Hadees, Jesus conceivably will return to Earth as a just ruler before the Day of Judgment. Hadees reference both the Mahdi and Isa simultaneously and the return of the Mahdi will coincide with the return of Isa, who will descend from the heavens in al-Quds at dawn. The two will meet, and the Mahdi will lead the people in Fajr prayer. After the prayer, they will open a gate to the west and encounter Masih ad-Dajjal (antichrist). After the defeat of ad-Dajjal, Isa will lead a peaceful forty-year reign until his death. He will be buried in a tomb beside Muhammad in Medina. His main mission will be the defeat of false Messiah (the antichrist) and his 70,000 jews companions of Isfahan(Iran). The story of Yajooj and Majooj, also recognized as the Gog and Magog, was widespread to a state that was cruel. They were wild tribe who behaved like animals and formed chaos for the people living near. Gog and Magog demolished the people’s harvests, killed their families and made their lives a tragic loss. Gog and Magog used to come from a highland that had a crack in it. These communities made their way through that crack and created turmoil for the people living outside that zone. King Zulqarnain, was a Muslim King who toured across the globe and governed most of it. One day, it is described that he was wandering north when he came crossways this mountain. The people begged him to help them get rid of Gog and Magog. King Zulqarnain approved and obvious to seal the crack of the mountain with bits of iron, imprisoning the cruel tribes. According to sayings of Prophet Muhammad PBUH Gog and Magog have been trying to break down the wall since that day. However, in future during the period of Isa (Jesus) Gog and Magog will be set free. That would be the period when they will arise with full control again and will cause vast danger to the world. The globe would convert messy after their return. There will be a lack of food and water, people of that time will live in utter misery. Until Allah (the creator) would listen to Jesus and his follower’s prayers and will create a group of insects that will kill the entire tribe of Gog and Magog hence peace would feast again. Prophet Muhammad PBUH said that last hour will not come until you witness the sinking of land in three places i.e. East, West and an island in Arab. This prophecy refers to the smoke, which will cover the whole planet. It will be very painful for the non-believers that it will bust their ears and will only be like flu for righteous people of that time. The beast will talk to the people and will mark people their faces and categorize them as good and evil. It is so interesting that unlike Jews and Christians, Muslims are not just waiting for a Messiah, whereas they are waiting for three important figures that are prophecies-ed to come in last times i.e. Mahdi, Anti-Christ and the Jesus Christ. Muslims are watching the events very closely taking place globally. It is the solemn belief of Muslims that after the great fire the judgment day will be set and all of dead will be resurrected and their deeds will be judged by Allah.